← Will the last one out please switch off the turntable? 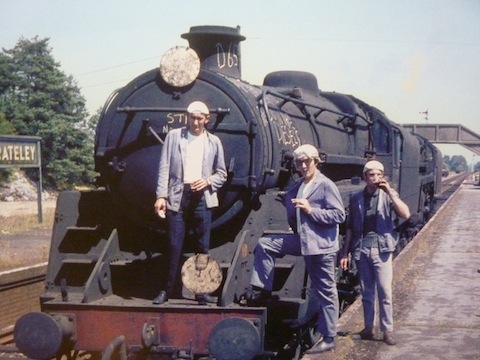 My Dad was only on the railways for eight years, but that 1953/61 spell as loco cleaner then fireman meant so much to him, and despite his following three decades as a postman, he never lost his love for steam. I often wonder what would have become of him if he’d taken a different path, but instead he oversaw from a close distance the steam engines making way for diesels and electrics, having quit in a bid to seek a better wage for his growing family. While his link with that world was partly severed in the early ’60s, the next generation of railwaymen witnessed first-hand the end of steam, including fellow Guildford-based fireman Geoff Burch. Like my Dad, Geoff loved trains from an early age, watching ‘coffee pots’ and ‘flat tops’ pass the classroom window on the Guildford to Woking line, or visiting Brookwood, Reading, Woking and the capital with his trusty Ian Allan ABC spotting guide, hanging out at the Chalk Farm loco sheds, Kings Cross, Liverpool Street and Waterloo, getting his fix of A4 Pacifics, Britannia class locos, Castles and Kings. 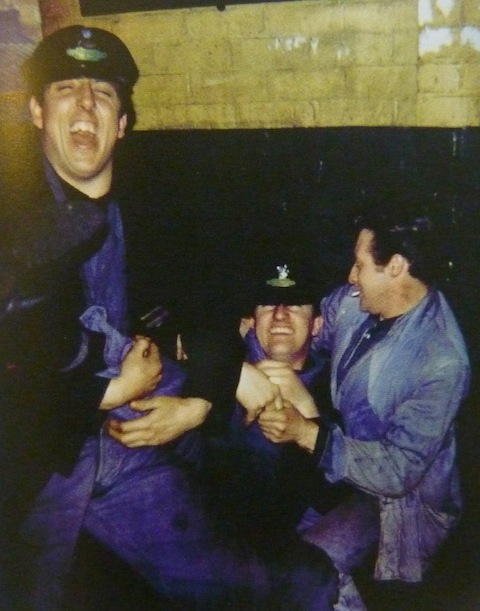 In time, Geoff plucked up courage to speak to the drivers, with cab invites ever more frequent, finally leading to his own footplate days, as told in detail in his epic 2011 publishing debut The Ramblings of a Railwayman, covering his career journey from April 1961 to July 1967. Athough my Dad moved on within six months of Geoff’s arrival, they shared a history and deep love and respect for all they saw and those they worked alongside – man and machine. 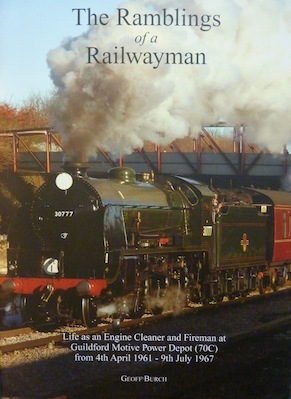 Geoff conveys all of that and more in his original memoir and newly-published follow-up Further Ramblings of Railwaymen (2012), a further epic providing valuable insight into that love of steam that was the dream for so many boys – the hope of one day becoming an engine driver, despite all its hard toil and unsocial hours. While my old man watched from a distance as steam locos were in many cases needlessly scrapped – on the whim of a short-sighted ‘progressive’ Government in those dark days of the Beeching Report and all that – Geoff was there for those memorable last days. His first book is all the more significant for its description of many of the characters who made the railways tick in the ’60s. This is no cold memoir about gauge measurements and engineering know-how. It is primarily about the working man. The fact that the author was a keen photographer helps, and as well as recording his early career with his camera, he stayed in touch with other railwaymen who did the same. That included fellow firemen Alex McClymont and Dave Salmon, whose memories and pictures feature in his follow-up, and Lew Wooldridge, who had the foresight to capture those halcyon days on 8mm cine film, recently released on DVD thanks to John McIvor and SVS Films (with a link here). Many stills of railwaymen from that film made their way into Geoff’s labour of love, and that film and these two books perfectly encapsulate the era and give a moving (in more ways than one) record of an important era in our recent industrial past. Geoff’s own railway career outlasted many of those locos (the ones no one could restore at the time), a transfer to Woking’s traction department in the late summer of 1967 as a ‘second-man’ leading to in-house exam success and eventual promotion to driver status at Effingham in 1972, with later spells at Woking and Waterloo. 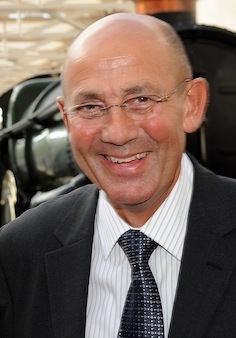 In time, he moved to the training side, and while privatisation led to the end of a 33-year career, he kept in touch with old workmates during a new chapter at Surrey Police, before returning to the rail industry in 2004. Geoff’s first book covers his formative and firing days, the text and photos cataloguing day-to-day duties, his apprenticeship and working visits to London’s Nine Elms depot and those at Feltham, Reading, Fratton and Redhill, as he moved through the links. 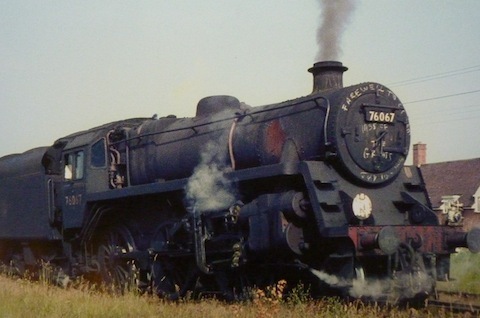 Among the more poignant photographs (and there are lots of superb shots) are those taken during those last days of steam, from 1965 onwards, on the doomed Guildford to Horsham line, then in more detail in 1967, including one taken across from the road I grew up in at Shalford, and several from the final Salisbury run on a baking-hot, emotional mid-July day, while hundreds lined the bridges and trackside en route. Those halcyon days were also recorded on canvas by famed railway and wildlife artist and preservationist David Shepherd, and he wrote an introduction to the first book, while respected railway photo archivist Mike Morant does the same for the follow-up. What sets these books apart from many others in a congested market is his first-hand focus on the ordinary men who worked these lines. The publication of the first book would have been enough to secure Geoff’s place in steam railway lit, and his latest takes that further, with a wealth of superb photographs – many previously unpublished – illustrating these personal ‘rambling’ recollections. As for the author, he’s certainly packed a lot into his official ‘retirement’ since 2009, and work is already underway for a third publication, offering a different dimension again, but one no less worthy. Update (November 2014): The Ramblings of a Railwayman has completely sold out in hardback but is still available as an e-book for £6.99 or on CD for £7.99. 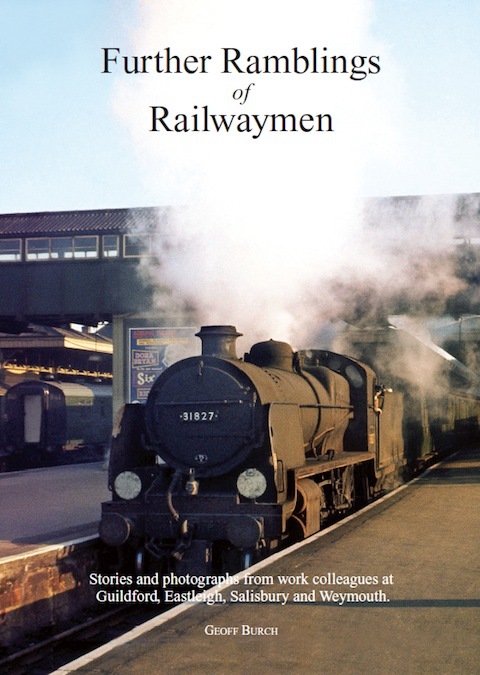 The remaining copies of the Further Ramblings of Railwaymen hardback are available at a bargain half-price of £12.50 as well as in e-book format (£6.99). For the hardback, add £5 per book for postage and packaging, enquiring via geoff.burch@hotmail.co.uk. Copies of the second book are also available at Ben’s Collectors Records, Tunsgate, Guildford. Geoff Burch is also regularly out and about giving talks around Surrey and Hants on his books. Check his http://www.ramblingrailwayman.co.uk/ website for details of those events and much more. 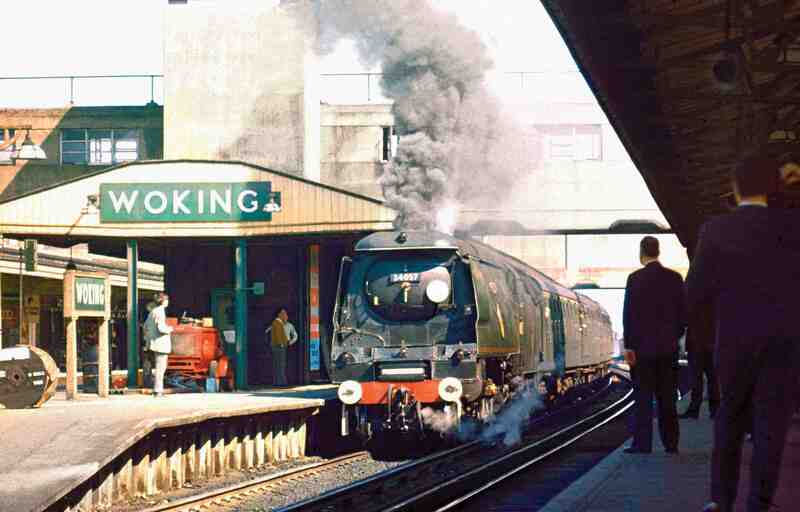 This entry was posted in Books Films, TV & Radio, Railways and tagged David Shepherd, Further Ramblings of Railwaymen, Geoff Burch, guildford, Nine Elms, Railways, Steam, Surrey, SVS Films, The Ramblings of a Railwayman, Woking. Bookmark the permalink.